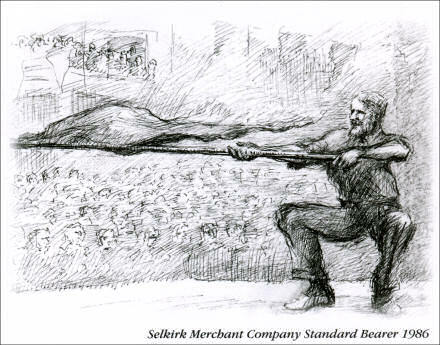 Sketch of Ian W. Mitchell as Selkirk Merchant Company Standard Bearer, 1986. Scanned from the back page of his Service of Thanksgiving order of service booklet. Today I drove down to Selkirk for a Service of Thanksgiving for Ian W. Mitchell (known to Jenni, Eddie and me as Uncle Ian), a weel kent face aroond Selkirk, and a life-long and very dear friend of my Mum, and my sister Jenni’s godfather. Ian died a few days ago of cancer. The service was a joyful celebration of Ian’s life: “cheeky so-and-so”, engineer, lecturer, photographer, community servant and family man. The appreciation was given by the Rev Jim Campbell, the parish minister in Selkirk, who was at St Mary’s College, University of St Andrews at the same time as me, and it was great. In fact the whole service was, as I said a joyful celebration. There are some funerals that I’ve been to where I’ve left the church building feeling worse than when I arrived, but today’s was one that lifted your spirits, gave hope and a boosted determination to make a difference, because Ian certainly made a difference to those around him. Following the service we return to the Mitchell’s house — a house I’ve not been in since I was a wee boy. It was funny because I remembered it pretty much exactly as it was, only smaller — but then everything seemed bigger in those days! Walking into the kitchen I caught up with an old school friend, Janice. I was quite delighted that she recognised me — because oddly some old friends of mine don’t seem to! It was a real delight to catch up with her news, share some of mine, and have a laugh. She was one of the few people there that I really knew — a lot of faces I recognised and names I knew, but few old friends. When Janice had to go, I went in search of my Mum and found Janice’s brother Robert in the living room, with whom I used to sing in the Borders Youth Choir. We exchanged a few reminiscences and then I had to go. Driving back to Edinburgh in the late afternoon I was struck by the simple beauty of the Scottish Borders countryside: the greens, and reds, and oranges, and yellows, in the hills and trees, washed over with a light mist; the blue sky transitioning into the evening. As the miles ticked by I realised just how much I love the Borders, how much I still regard it as home. And I relished that moment — living in the now — realising just how fortunate I am to have a community that I can return to and be known (even if by only one or two) and be understood. I’m fortunate to have that heritage, and extended family. In that moment I realised that I was content. Even though the day was infused with the sadness of Uncle Ian’s death, there was a blessing in those who had gathered with their stories of Ian, and the stories of their own lives. There was a blessing in our simply being together and remembering, and also making new connections, and re-establishing old connections too. Today, in the midst of the realities of death, there was very much an affirmation of the goodness and wonder and mystery of life. As the miles clocked by, and the scenery’s colours darkened, I let Soulfly‘s Dark Ages album wash over me, and let the tears trickle down my face, and I worshipped God.